Sunday December 8th 1878. It was a faithful snowy day. I did not go to church. Rob and I went to John Hendersons funeral this afternoon. He died yesterday morning. I wrote a long letter to Vene in the evening John Whetstone was over. It stopped snowing at dark. Monday December 9th 1878 I ironed till eleven oclock and then got ready to go to town I paid some debts, went to see the dentist about my teeth. I called on Mollie Hand to see her baby. Then I went up to Wins where I stayed till nearly night. I knit a little in the evening and went to bed early. 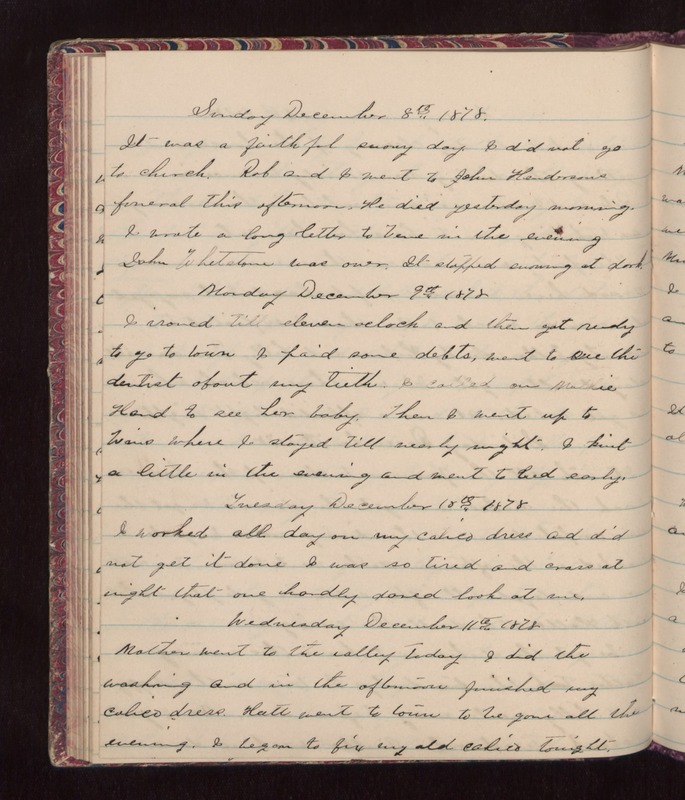 Tuesday December 10th 1878 I worked all day on my calico dress and did not get it done I was so tired and cross at night that one hardly dared look at me. Wednesday December 11th 1878 Mother went to the valley today I did the washing and in the afternoon finished my calico dress. Hatt went to town to be gone all the evening. I began to fix my old calico tonight.